Greetings, Guardians! 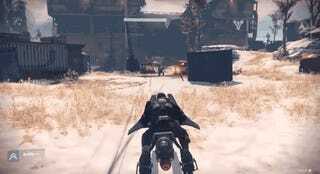 You’ve picked up Destiny for your gaming console of choice, loaded up your pulse rifle, and you’re getting ready to head to the Cosmodrome to fight The Darkness. It’s dangerous to go alone, you know. We’ve been playing the game since the servers went live Monday morning, and have amassed a bunch of starting tips to help you on your way. Notes: These tips are mostly focused on the single-player/co-op stuff, and not on the crucible multiplayer. Also, these tips will doubtless evolve somewhat over the weeks to come, and in their current state are aimed mostly at players starting out, not at anyone concerned with high-level play or endgame stuff. Ready? Let’s hop on our speeder bikes and set a course for knowledge. Unlike in some other types of RPGs (or RPG-like games), your class in Destiny doesn’t make a huuuge difference. It’s mostly about what kind of abilities you want to use - the Titan gets an aggressive ground-pound that puts him or her out in harm’s way, the Warlock gets a superbomb that he/she can toss from a distance, and the Hunter gets a golden gun that does a ton of damage. They have stat differences, but once you’ve put on some levels you can choose to focus on different areas. As far as we can tell from our time with the game, the class you choose comes down largely to personal preference. If you want to know more, IGN has some terrific wikis dedicated to each class: Warlock, Hunter, and Titan. 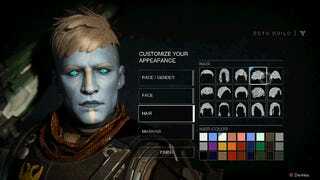 Destiny has the best video game hair we’ve ever seen. If you’re going to spend a long time on something, spend a long time deciding on your character’s hair. Sure, it’ll spend most of the game hidden underneath a helmet, but in cutscenes and when walking around town, it’s worth taking the time to make sure you look pretty. This might seem obvious for anyone who has explored games with big maps or a heavy emphasis on weaponry—think Borderlands or any MMO—but it’s particularly noteworthy in Destiny, because chests are pretty rare. There are, as far as we can tell, roughly five gold chests per planet. They usually come with a stack of glimmer—Destiny’s currency—and either some armor or guns. If you’re not sure how many chests you’ve found, don’t worry. The destination map from your ship’s command will clue you in. There are chests on every major planet in the game, and they’ve already been well-chronicled. You can find a guide showing each chest location here. You’ll definitely want to get chests your first time through an area, since chests don’t level up with you - if you come back for them once you’re above the general level of the patrol zone, you’ll wind up with gear you don’t want. If you get an encrypted engram, it actually does level with you - it’s locked to whatever rarity it was when you discovered it, but it won’t be assigned stats until you have the cryptarch in town decode it. So, if you’re about to level up, wait to have the cryptarch decode it until you’re sure you’re ready for an upgrade of whatever weapon or armor type it is. Happily, you don’t have to go to a shop to sell extra gear in Destiny - you can dismantle it directly from your inventory and get cash in return. Do so often, particularly with common weapons that you’ve long since outgrown. If you’re thinking of making a couple of alt characters in different classes, have your main character store some loot for them to use. Especially as you get into the high-level endgame, you’ll wind up with extra rare weapons and armor pieces that could be very helpful to your lower-level characters. Head to the vault in town and store spare items there, particularly rare armor pieces with “light” value. Your vault items and your cash reserves are pooled between all of your characters, so once your other characters meet the level requirement, they’ll be able to use much better gear than they’d find on their own. There is a sad, lonely robot in the hallway between the town plaza and the lady who sells ships. He stands there all day and night, tirelessly sweeping the same spot on the ground. When you pass him, pause to consider the robot. See how he ceaselessly repeats the same activity over and over, how unaware he is of his own insignificance? Perhaps we’re more like the robot than we’d care to admit. You can’t pause in Destiny. Ever. Don’t forget that! Otherwise you’ll proooobably get killed in an embarrassing way next time you get up for a pee. The boost-jump is one of Destiny’s most mechanically interesting tricks - after you get a few levels, depending on your class, you’ll get an ability that lets you make special jumps. Each character has a specific sort of move, and they all take a bit of getting used to. For example, as a Warlock, if you tap the jump button twice quickly, you’ll get the maximum boost - don’t wait until the pinnacle of your jump to press it, or you won’t get much juice. However, there are times, particularly in competitive multiplayer, where you won’t want to ride a full boost, since it’ll leave you vulnerable up in the air. Eventually you’ll level up enough to unlock the ability to control what direction you float in, too, or upgrade its speed. It’s worth taking some time in a safe area to practice and get a feel for getting around. Every time Peter Dinklage reads a line in a way that indicates he has no idea what the words he’s speaking are supposed to mean, take a drink. Warning: Only play this game if you’ve had something to eat first. On missions, you’ll occasionally enter an area where there are no respawns. That means that if your whole team goes down at the same time with no one to revive them, you’ll have to start back at a checkpoint. Sometimes, your teammates will get aced out in the open, and you’ll have to risk your neck to revive them. Remember, however, that they also have a countdown respawn timer. If you’re safe behind cover, it can be smarter to wait for your teammates to respawn on their own, rather than risking dying to revive them, since if you die, you’ll all have to start over. You’ll feel guilty leaving them out there, but it’s okay - you have your team’s best interests at heart. Sure, your main gun can run dry for a bit. But you can’t permanently run out of ammo in Destiny—if you get your secondary weapon down to a low amount of ammo (we’re guessing it’s gotta be less than half) and deplete your primary ammo reserves (you can have a full clip in, but the reserve number has to read 0), you can wait 30 seconds and you’ll get a sudden influx of primary, secondary, and sometimes even heavy weapon ammo. It can be a great boon when fighting a tank-like strike boss—sometimes it’s smarter to empty your ammo and hide for 30 seconds, rather than run around the battlefield looking for ammo packs. Bounties are basically challenge-based quests—sometimes with specific orders to carry out or just a specific enemy to kill—that offer substantial XP boosts and can really help boost your level. You can only hold a certain number of bounties at a time, so you’ll want to prioritize. Are you planning on spending the next few hours in the Crucible for rounds of competitive multiplayer? Then you’ll want to take all the Crucible-specific bounties so you can (hopefully) knock them out in one or two gos. If you’re planning on spending a lot of time on the Moon, it makes sense to carry only the Moon-based bounties so you don’t have to do too many return trips. Also, remember that the bounty robot refreshes its stock every so often, so check back whenever you’re in town. Many, Many Hours Later: I cannot stress this enough: If you want to have a big leg up in Destiny’s post-level-cap world, you’re going to want to do every single bounty you can, every day. Bounties refresh every 24 hours and are the fastest way of earning reputation points for your vanguard or faction, which will let you get to rank 2, which is where you’ll need to be to buy the legendary armor that’ll quickly push you past level 20. Most bounties are very easy to do, particularly once you’re higher level, so do ‘em! Every daily bounty you don’t do is a missed shot at some easy faction rep.
You can usually get a bounty that gives you an XP reward for completing six of the “patrol” sidequests on each planet, so it’s a good idea to wait to do too many of those until you have a bounty that’ll give you extra rewards for completing them. Each class has a specific Vanguard character that they can check in with between story missions. That person is usually waiting for you to turn in trophies after completing major quests, and it’s a very good idea to check in with them on the reg. Not only will they give you a reward of a good piece of armor, you can also buy some really powerful gear from them for cheap, provided you meet the level requirement. It’s also smart to look at the loot you can’t afford to use yet, and make a mental note to come back once you’ve reached the appropriate level. In addition to the normal stores in town, there’s also a special vendor called the Agent Of The Nine who’s only open on weekends. You can spend “strange coins” there to get some extremely cool gear. If you’re playing on a weekend, be sure to see what he’s got. Important note: Don’t spend the motes of light that you earn post-level-20 on anything but stuff you can buy from the special weekend vendor. If you have enough saved up, you can get an exotic engram from him along with whatever weapon/armor you can afford. If you played the beta or undertook a few other activities before Destiny came out, you’ve probably got a free emblem or two waiting for you in town. It’s easy to forget to pick it up, however. To get your emblems, go to the “special deliveries” person in town—she’s located in the same kiosk as the postmaster, towards the landing zone. Some players will likely skip Destiny’s player-vs.-player Crucible multiplayer entirely, preferring to focus on the co-op grind of the campaign stuff. (Of course, other players will probably focus only on the Crucible.) If you’re one of the former type, push yourself to give the Crucible a shot. You can earn some hefty XP rewards in the early goings by taking bounties to complete a certain number of matches—which, crucially, you don’t have to win, just complete. As it just so happens (clever Bungie), that number of matches is right around what it takes to get yourself familiar with Crucible multiplayer, and likely get interested in playing more. It can feel a touch limiting that your sparrow speeder bike doesn’t have any guns. However, if you time it right, you can turn it into an improvised explosive device, as seen in this video from Wombat Gaming. Just aim your bike in the right direction, hop off, and shoot it to send it flying. Not the most efficient way of killing enemies, but one of the funniest. This might sound silly, but it’s actually pretty easy to forget to check the waypoint in the upper-left corner of the screen and spend a while cruising in the wrong direction. Destiny’s waypoint-checking system is a bit annoying, since you have to take out your Ghost to get the markers to appear on the screen, but once you get a certain rhythm down, you can check pretty easily. When you’re on your Sparrow speeder bike, it’s easy to hit the button to make your mission waypoints pop up. However, if you just hit the button once, you’ll have your ghost out (instead of a weapon) if you hop off your bike shortly afterward. Which is annoying. Get in the habit of pressing the waypoint button twice, which will “put away” your ghost (and waypoints) so you’re ready to rock in case you need to quickly dismount. Kirk: That said, if you’re going to play the story missions in co-op, I’ve found it’s more fun to play along with people who are around your level. So, while it’s annoying, if you’re planning to play through the campaign with one or two friends, try to start out together and don’t get too far leveled when you’re apart. Tina: I much prefer taking teammates with me on strikes and missions if I can help it. I find it’s even worth making your fireteam public, which you can change in the character roster menu. If you prefer to keep things solo, or play only with friends, that’s of course your choice. But public matches can work well, and most of the co-op stuff doesn’t require chat for a team to work well together. Your melee attack is one of your most useful weapons, and careful tactical use can help you dominate the battlefield. Enemies will usually stick to one piece of cover, so if you can clear a path up and around that piece of cover, then melee the enemy who was hiding there, and you’ll have headed off one of the flanks of the battlefield, killed a hiding enemy, and wound up safely behind cover. Provided you’ve spent points building your character in this way, you’ll also be granted some kind of bonus for each melee kill. A slightly obvious tip, but: If you’re taking on a bunch of the Fallen or the Hive, remember to aim for the head. You can one-hit-kill a number of enemies that’d take a few body shots to go down. That can be particularly useful when dealing with the Hive’s running melee attackers, since you really don’t want to let more than one get within swatting distance. That said, the Vex robots you’ll first meet on Venus actually have weak spots in their chests, not their heads. When you’re fighting Vex Goblins, aim for the chest if you want to kill them quickly. A headshot can cause them to go berserk, making them harder to kill. Especially if you’re playing solo, Destiny becomes a lot more fun if you’re just sliiightly higher level than the enemies you’re fighting. If there’s a level 10 story mission, hit it at level 10 or level 11. If you go in at level 8 or 9, it’ll be much more of a slog. That said, if you’re really good at the game, or have a few high-level friends, going in too early is a good way to give yourself a stiffer challenge. If you enter your character loadout screen and then press the right shoulder button, you’ll be taken over to the inventory screen. That’s where you can check your bounties and whatever odd items you’ve picked up, but it’s also where you can consume various items that cause enemies of a certain type to drop more money. It’s very easy to forget to use these, but they do provide a cash boost, so use ‘em or loose ‘em. Once you have enough cash, you can buy custom shaders to make your character look extra pretty. (To get these, go to the outfitter halfway between the town plaza and the speaker’s hall, to the west after you land.) Shaders are pretty expensive, and it’s hard to get a sense of how you’ll look wearing them. Fortunately, a bunch of fans have already taken to documenting what the various color schemes look like. We’ve amassed a bunch of them here, so you can peruse before you buy. Mars: Relic Iron.) Those materials don’t come in handy until post-level-20, but they’re very handy then. You can usually spot them because they’ll stand out somewhat against the other flora in the background. Remember to reload your weapons, particularly your special and heavy weapons, in between encounters. Nothing’s worse than whipping out your rocket launcher to hit a massive boss, only to find yourself hiding behind a rock because you forgot to reload the last time you used it. It’s tempting to be stingy with your grenades and secondary weapon ammo, but it’s actually best to use both liberally. You’ll find secondary ammo lying around all over the place, so it’s pretty easy to use your shotgun/sniper rifle/whathaveyou more often than you might think. Obviously, save your grenades for groups of enemies; it’s rarely worth it to waste a grenade on a single enemy, unless it’s a big raid boss. You may also want to consider saving grenades for crowd control when things get too chaotic for comfort. Once you’ve played a few hours, you’ll have a good collection of abilities at your disposal. You’ll have your primary weapon, your secondary weapon, your special weapon, your grenade, your melee power-attack, and your super attack. Learn to inventory each of those separately, which will give you a sense of what you’ve got “loaded” at any given moment. You’ll want to ration your special attacks so that you aren’t wasting overpowered weaponry on lower-level enemies. Almost every encounter builds to a crescendo with a boss or a mob of powered-up regular enemies, so keep that in mind. If your super is charged midway through a wave-defense challenge, save it for the boss that’s likely just around the corner. It seems like an easy calculation: This pair of gauntlets has 80 defense and this other one has 110, so...obviously the higher number, right? Destiny’s weapons and armor that are categorized by either a blue or green icon are upgradeable. So if you’re a fan of Auto Rifles and if that 80-defense gauntlet has an upgradeable perk that works specifically for Auto Rifles, it actually might be more useful to you to build on the setup you want. Before the upgrades are made available to you, you can view them by clicking for details on each item. It’s a good way to plan ahead and think a bit deeper about how you want to customize your loadout. It’s a cliché (and somewhat inaccurate) to say that Destiny ‘starts’ at level 20, but the game certainly becomes substantially different once you hit the level cap. There are several good articles you can read to help you maximize your growth post-level-2o: This one, with general tips for life after the level cap, and this one, which focuses specifically on legendary gear. Your primary weapon will be something like an Auto Rifle or Hand Cannon or Scout Rifle or Pulse Rifle. The secondary weapons are a bit more diverse, like energy weapons, sniper rifles, and shotguns. It’s important to keep both a sniper rifle and a shotgun on hand for both the campaign and the Crucible. At any point of time, you can swap between items in your inventory. When you’re trying to pick off enemies from a distance, you can rely on your sniper rifle. But at the end of that raid, when you’re likely in a more enclosed area stuck with a raid boss of some variation, the shotgun becomes incredibly useful. Same goes for multiplayer matches, which will occasionally call for different tactics based on which map you’re on. 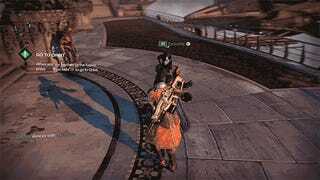 It’s maybe our favorite thing to do in Destiny, and we’ve certainly captured enough GIFs of it for our own amusement...but there’s something so pleasant about exchanging a hurrah amongst strangers turned comrades. You’ve emerged victorious—while it’s smart to do a quick run to check for ammo and loot, it’s still worth taking a few seconds out to do a dance with your new friends. It’s actually surprising just how much more fun and meaningful a bit of goofy interaction can make Destiny feel. Embrace it! 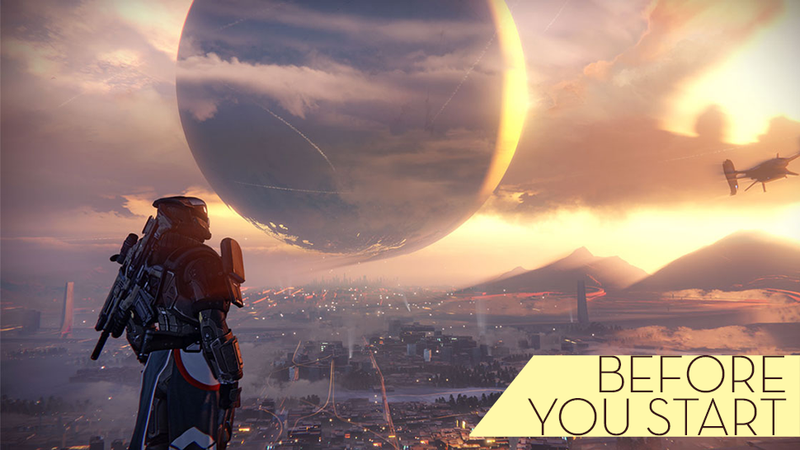 Those are our tips for starting out in Destiny. We hope they’re helpful, and if you have any other advice (or want to pick a bone with anything we’ve got here), we hope you’ll sound off in the comments. Good luck out there, and keep an eye out for us. We’ll be the ones dancing like idiots. To contact the authors of this post, write to kirk@kotaku.com or tina@kotaku.com, or find them on Twitter @kirkhamilton and @tinaamini. Update 9/12/14: We’ve added a handful of tips after spending more time with the game, and have refined a few others for clarity. Update 9/19/14: We’ve added yet more tips, and some solid stuff for getting going after you finish the story and hit the level cap.